Old cell phones make for some easy money. 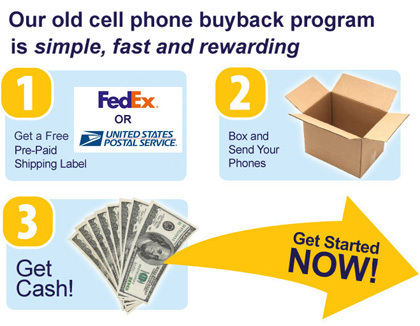 After upgrades, sell your old cell phone to PaceButler for some fast cash. There is no cost to you since we pay the shipping. Our modern technology is advancing and evolving at a dizzying pace, the latest and most sophisticated devices may become obsolete overnight. The rapid pace in which manufacturers are introducing new products plays directly into people's desire to always have the latest newfangled gadgets ever invented - new cars, new computers, new cell phones. As a result, we discard things at a very rapid pace also, and electronic junk like old cell phones are constantly piling up in our homes and in our landfills. There is an estimated 1 billion used cell phones in America today, and every year, we add 100 million more units into ever-growing stockpile. In almost every home across America today, there are several old cell phones discarded and forgotten, hidden in a drawer or locker inside the house. Given the chance to free your home of these electronic junk and earn some extra cash, would you sell these old cell phones? Of course, you would. Well, you're in the right place - Pacebutler Corporation is prepared to pay up to $100 for every piece of used mobile phone in your house that you ship to us. Naturally, we will pay for the shipping. What do we do with those old cell phones, you might ask. We are a leading buyer and seller of used cell phones in the United States. Most of the phones that we purchase are refitted or refurbished and sold to wholesale buyers to be used in countries in South America and Asia. Some are donated to charity, while non-working and damaged units are recycled through our partner, the American Cell Phone Drive. Every cellular phone that we receive will always be disposed of properly, either through recycling or reuse. Old cell phones, like all other discarded electronic devices, frequently contain dangerous chemicals and heavy metals such as mercury, brominated flame retardants (BFR), and cadmium. When these phones are irresponsibly dumped in our landfills, there's a good chance that those chemicals will pollute the environment - the soil and water ways near the landfills - and become a threat to people's health. Those used mobile phones must be kept away from our landfills, as much as possible, obviously. Doing business with Pacebutler to sell us your old cell phones is quite easy. The four steps are: determine the actual price of your cellular phones by visiting or Purchase Price List, print out the shipping label, and box and ship the phones to us. Done. Just wait for your check in the mail, we do issue checks within 2 business days after receiving the phones. If you're looking to get rid of electronic clutter, help protect or environment, and be paid a fair price for those old cell phones, ship those phones to Pacebutler, today. It's the best call to make. "Thank you. We did receive the check last week... We appreciate that there is somewhere for used phones to go besides in the closet or garbage. " "Yes this was a very easy and pleasant transaction, I had my old Cell phones just sitting around not being used and when I discovered your ad in a magazine I decided to check your company out. I was very pleased with how quick and easy it was to find out the value of my old phones right on your website. All instructions to send phones in were easy to follow and all postage was paid as well. I also received a phone call directly from PaceButler, they were just checking to make sure I had everything I needed to send phones in and that I understood the whole transaction. I really felt taken care of and that this company genuinely cared about my satisfaction. I received my check within a couple days of sending my phones in. I will recommend PaceButler to everyone." Old Cell Phones have new life through PaceButler.